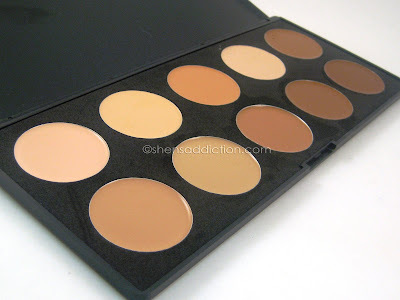 Dollface Cosmetics is one of the online shops that is selling makeup palettes at reasonable prices. I'm not saying that you shouldn't order from abroad but if you hate waiting like I do, I suggest you purchase from either Dollface Cosmetics or Space Pretty Store, it's not any different. They have lighting fast shipping, reasonable to almost free shipping, no-fuss transaction and very well secured packaging. 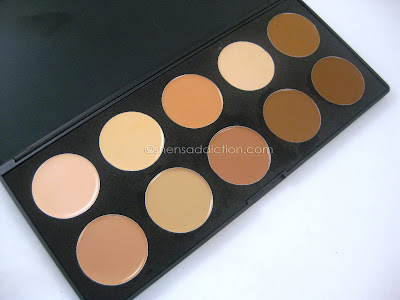 I now call this palette the Cream ontour and Concealer Palette because the dark shades of are best used as cream contour. Our teacher, Ms. Cheryl, taught us this technique on our third session. Which also reminded me of Eve Pearl's foundation technique. What a way to maximize the darker colors of the palette i thought I'd never use. As for it being a concealer palette, I'm sure many makeup artists will appreciate the wide range of shades in one container. The coverage is decent enough. Its creamy but not too creamy. Very much easy to blend. But I have yet to test the longevity of this product on shoots or everyday use. But you can remedy fading or caking that by setting it properly. Its really not bad especially when you're just practising. Just try to keep it away from warm area as it tends to get oily much like other concealers I own. Tested it out today! :) I find that it covers my blemishes fairly well. I love that I don't have to reach out for jars or containers. It doesn't have that unpleasant smell, reminds of Cinema Secrets but with less coverage. No cakey effect, too. Love it! 4 out 5 stars in my book! 4 because you really can't beat the availability of it here in the Philippines, the affordable price, the shipping fee and the number of shades and uses of each. I learned how to contour using cream formula. That way when I have the funds to purchase Makeup Forever's Panstick, I know its not just on a whim because I'll be able to use it properly as Sophie did when I modeled for her. Contouring with cream lasts longer and looks more natural since you'll lightly top it off with foundation. This is highly recommended especially for bridal makeup or men's makeup. I learned how to mimic skin shade to make sure that I cover all blemishes properly without looking it whitish or rather darker. Falling in love with cream contouring. click photo to enlarge! get a closer look! I truly find this makeup lesson trying but still feel accomplished. 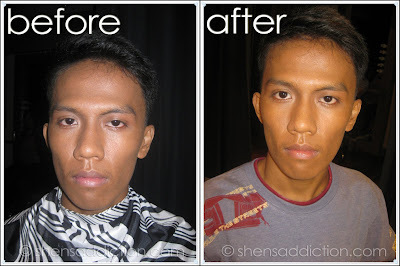 I love how his cheekbones are accentuated and the eyes looks more open than his before pic. Even if I've had experience in doing Men's makeup in the past, I found that I had so much more to learn. I like doing men's makeup because its fast but still challenging. Cream contouring is pretty easy once you get the hang of it, so don't be afraid like I was. Just use little product at first and work your way through it til you get the desired look you want. Its easier to correct mistakes when small amount of product is used and just build it up as you go along. You can use the tip of your foundation brush to trace a line on the hallow of your cheeks as well other parts you wish to contour, blend it with another foundation brush or a sponge to create gradation. Learn the face shape of your face or model.. The technique is to make is as naturally oval shaped as you could. Blending is the KEY! blend blend blend! Not too much though. Just make sure there is a natural shading that is happening on your contour. Practice is another KEY. Practice as much as you could.